THE BLEACHER BRIEFINGS: How Will the BCS Play Out? How Will the BCS Play Out? There are only two weeks left in the college football season (excluding bowls), but there is plenty of football left to play in regards to figuring out which two teams will meet in Pasadena come January. There are still a myriad of possibilities. There are no certainties left, including the Seminoles, the team that seems to have the easiest path to the championship game. Pending a decision on the allegations against their quarterback and Heisman hopeful Jameis Winston, pollsters could push FSU down far enough to take them out of contention. I don't know if I can cover all the possibilities, but I'll try. Alabama, should they win out, will of course play for the title. But to do so, they will have to beat their biggest rival on Auburn's home turf. The No. 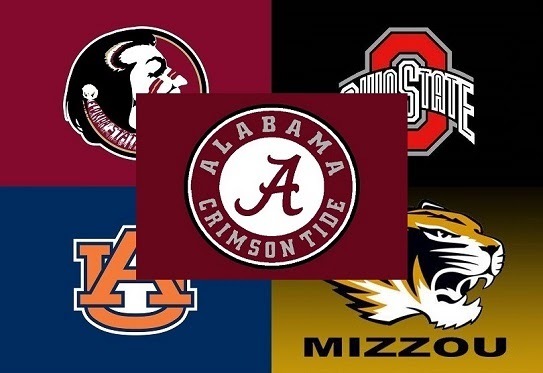 4 ranked Tigers will also be the highest ranked regular season foe Bama has faced in the past several years. Should the Crimson Tide get by them, they probably go up against current No. 5 (who will be higher when they play) Missouri in the SEC Championship. Two top 5 teams in back-to-back weeks. So if Alabama gets there this season, they will have certainly earned it. Ohio State needs help, either through the legal channels with Winston, or with those above them losing. But, the Buckeyes have their own problems, facing their biggest nemesis, Michigan, or their biggest challenge, Michigan State, in the Big 10 Championship. Either way, they have a tough road as well. I'm not sure if their fan base will be cheering louder for the Ohio State University this week, or Auburn. They have to be somewhat hesitant cheering for the Tigers, though. Some folks think if Auburn beats No. 1 on Saturday and Missouri next week, they could jump the Buckeyes in the rankings. I don't see that happening, but who knows? And what about those Tigers? Left for dead after a horrendous 3-9 season last year, coach Gus Malzahn has resurrected them to the national spotlight of three years ago when they won their national championship with Cam Newton. All Malzahn (who is almost a lock for National Coach of the Year) has done is guide Auburn to No. 4 in the country. The only thing that kept them from possibly being undefeated to this point was a bad first half in a monsoon at LSU several weeks back. For the Tigers to have a shot, they would need to take care of business on the Plains tomorrow against the Tide, go to Atlanta and dispose of Missouri, then go to Pasadena and take on whomever the No. 1 team is then. That is probably the toughest road for any of the top 4 to win the BCS. But wait, there's more. Missouri is in perfect position to get the chance. Yes, they need Ohio State to lose one of their remaining two (or Florida State in the ACC Championship, but that is the least likely of all scenarios). But if they beat either Auburn or Alabama (both ranked ahead of them) in the SEC Championship, things could get very interesting. Aside from those teams, I really don't see anyone having a chance, barring some incredible word problem that would give a Princeton PhD a headache (If No. 5 beats No. 2, and No. 9 beats No. 3, how many loses will it take for Clemson to have a shot?). But hey, stranger things have happened. And if you think this is confusing, just wait until next year when the playoff starts and we have to figure out all the scenarios for teams to get into the top 4. I think I'll retire from writing before then. I don't care who wins it as long as it isn't Alabama.